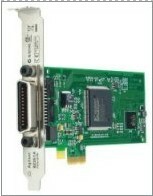 The Keysight (former Agilent) 82351A PCIe™-GPIB interface card is designed for integration into next generation PCs or workstations. It offers fast data transmission for various demanding test applications that require data to be transfered to memory fast enough without any lost or overwritten. The 82351A makes it easy to access and control instruments and exchange data using HTBasic or HP BASIC. PCIe™ (PCI Express) is an evolutionary version of PCI that offers a higher transfer rate across a low number of wires. It is also backward-compatible with PCI software, so you don't need to perform any code re-configuration. PCIe's powerful bus architecture allows bi-directional data transmission, and the implementation of a new class of test applications. The GPIB interface card plugs into a PCI slot in the backplane of your PC (x1, x2 or x8). Via a GPIB cable, this card connects to up 10 14 GPIB instruments. For VXI applications a GPIB cable connects the card to the command module in Slot 0 of the VXI mainframe. The 82351A comes with SICL and VISA software for Windows XP and above. This software is compatible with all previous versions of SICL/VISA. The hardware is software configurable and compatible with the plug&play standard for easy hardware installation. The GPIB interface card plugs into a PCI slot in the backplane of your PC. Via a GPIB cable, this card connects to GPIB instruments. For VXI applications a GPIB cable connects the card to the command module in Slot 0 of the VXI mainframe.